Tune Talk is the proud sponsor of the upcoming Justin Bieber concert and his movie “Never Say Never” in Malaysia. TuneTalk who is part of the AirAsia Group of companies. To get you started, your SIM Pack is already preloaded with RM4.00 credit with 30 days validity for immediate usage! Login to Tune Talk prepaid now! 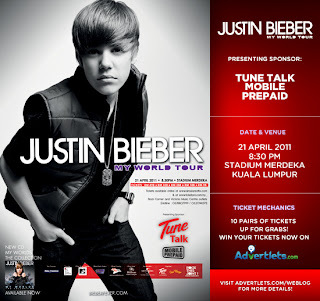 you will Never Say Never. Tune Talk is the proud sponsor of the upcoming Justin Bieber concert. 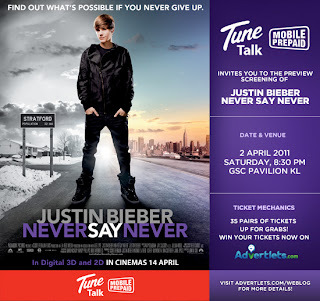 Check out my previous post 'Never Say Never to Justin Bieber LIVE in KL with Tune Talk' to find out how you can win the concert tickets.